The fish gods have been looking after a few of us here in Madeira the last couple of days. Yesterday “Tightline” was on fire. We watched them catch 2 fish right alongside us, a decent one around 400# and a big one over 800#. They switched both fish off the teasers and the bigger fish was foul hooked in the pectoral fin taking them just over an hour to get her to the boat. Big congrats to all on board. We were both fishing off Jardim Da Mar and it’s looking the best it has all season. Today it was our turn on the “Grander”. Jonboy decided to run straight to the spot rather than waste time trolling up there and it paid off. Within the first 30 mins of fishing we raised a nice fish on the long corner. After missing the lure a few times she dropped back and tried to eat the long rigger. She finally got it right and piled on the short rigger. Lainey did an awesome job in the chair and we had the 600 pounder alongside the boat in under 10 mins ready for a healthy release. After a few photo’s she swam away in excellent condition. “Our Mary” pulled the hook on a nice one right alongside us. Hopefully there are a few more fish starting to turn up. The fishing has still been a bit on the slow side for the fleet here in Madeira with only a few marlin seen over the last couple of days. “Margarita” let a nice one go and “Our Mary” pulled the hooks on a decent fish. 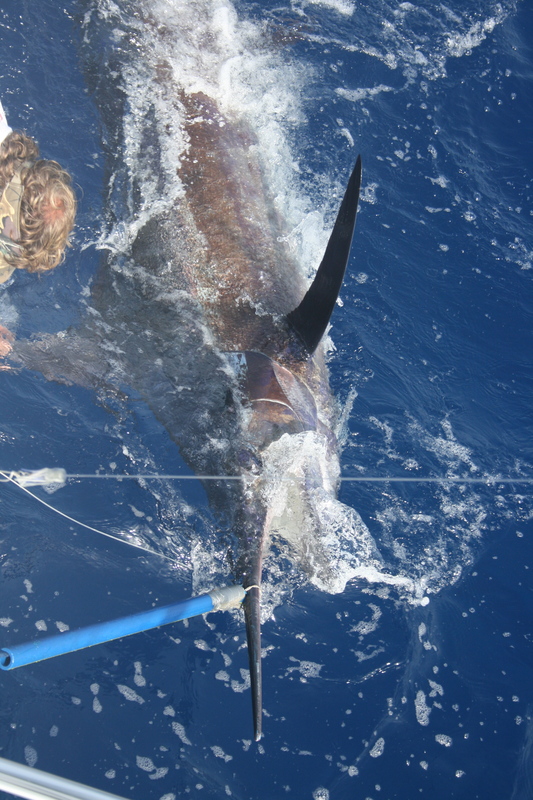 “Pesca Grossa” was fishing to west of Calheta when they lost a big one. 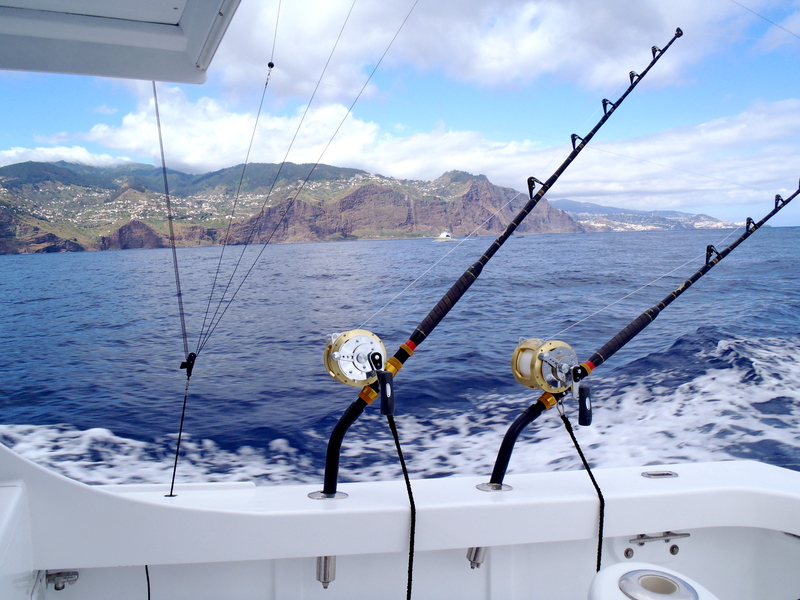 Andy told me the fish was over 800# and they only had it on for a short while before pulling the hook.Thats the beauty about fishing in Madeira,even though the fishing is slow when you do eventually raise a fish chances are it’s going to be a nice one. 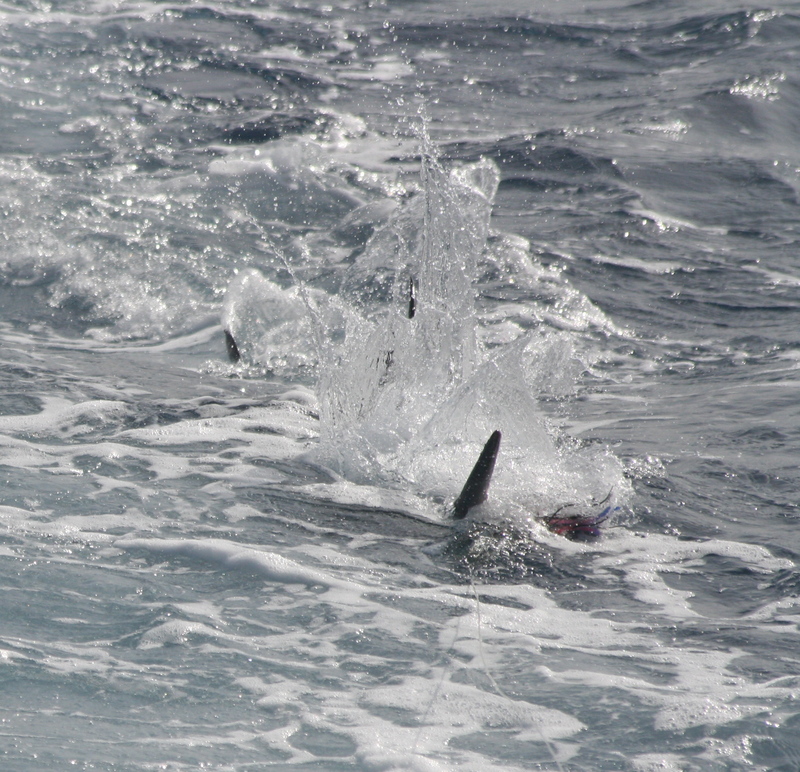 Yesterday on the “Grander” we found some bigeye tuna feeding out to the west. After missing one on the long rigger we stayed in the area and eventually hooked one on the stinger. After a good fight on stand up the fish came up tail wrapped. As soon as I was able to get the line of the tail the big tuna took of again and when Anthony got the fish up the last time I pulled the hook on the leader-buggar! A little discouraged we put the lures back out and in no time we were hooked up again. This time everything went right and after a short fight we had a nice bigeye in the boat. 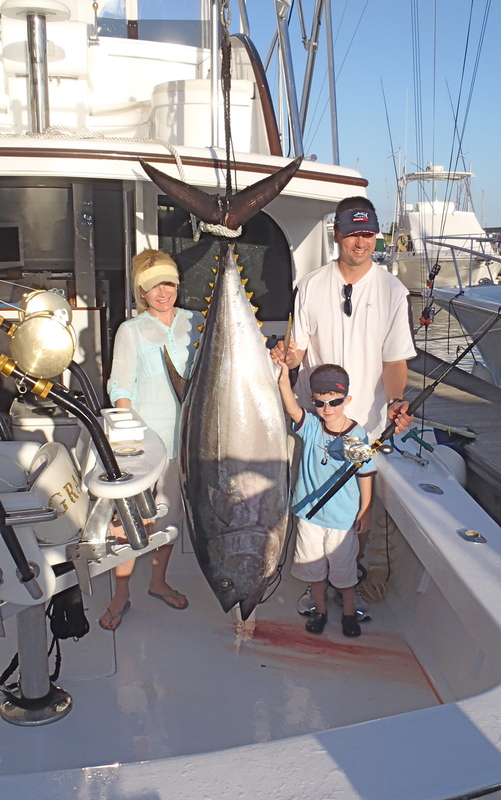 Back at the dock the fish pulled the scale down to 230# and Anthony was very happy with his personal best bigeye tuna. With the tough fishing we are having here in Madeira this season it’s not suprising that the enthusiasm level is getting very low amongst the fleet. And because of this there haven’t been many boats venturing out, only a few each day. “Our Mary” has been fishing well releasing 2 fish from 3 bites in the last 3 days. Captain Jose said they were both nice fish, one was around 800# and the other around 600#. Maybe a few more fish are starting to turn up. In 1994 there wasn’t a fish caught in June or July and then in August “French Look” caught 11 granders and the “Chunda” released 54 blue marlin. There still catching a few fish in Bermuda. A couple of days ago 3 boats all caught 1 fish from 3 bites with a few nice fish mixed in amongst them. The fishing has been a little up and down over the last few days. There was a good bite 3 days ago, I heard of at least 7-8 fish raised for the fleet with 3 nice one’s released. 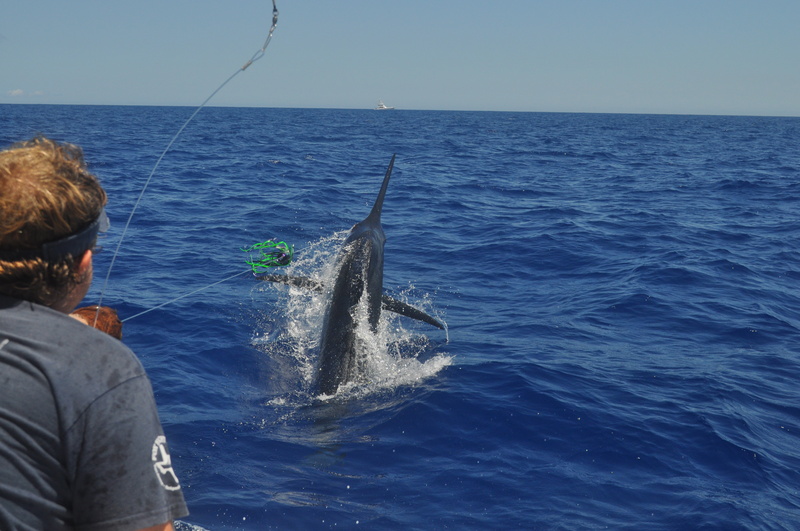 “Omega” pulled the hook on a big fish they called over 900# and “Cabo San Jaou” caught 1 from 2 bites releasing a 700 pounder. Yesterday the whole fleet was out and there was only 2 fish raised. “Balancal” let a nice one go and “Xareu” pulled the hook after their fish swam around a fish trap float. Very unlucky when you consider how long you may have to wait for a bite in this place. 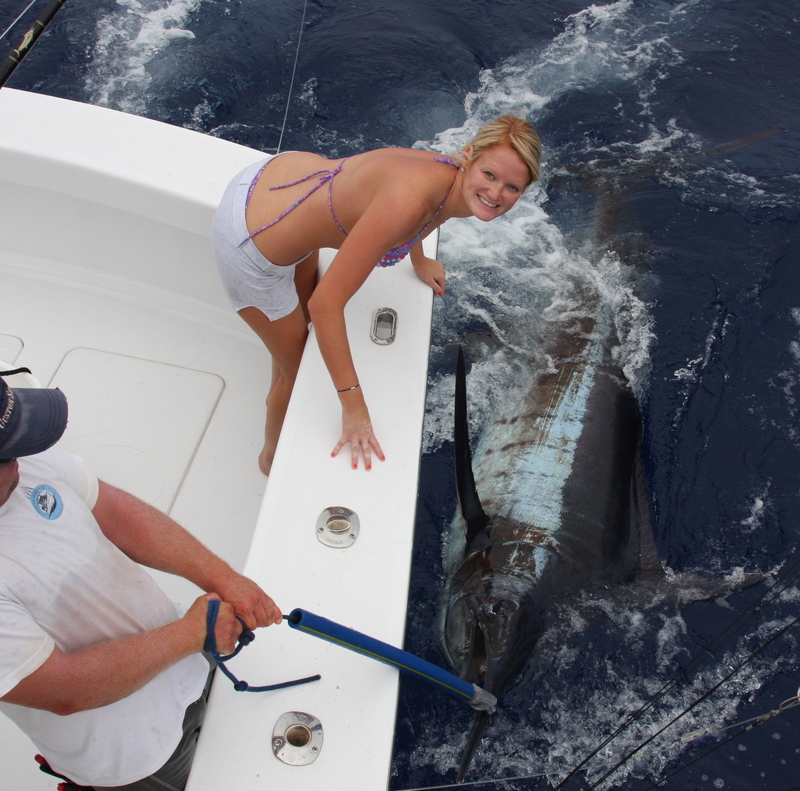 Today we took my wife Lisa fishing and she caught her first atlantic blue marlin. After a late start we decided to fish in front of the marina. Jonboy started marking a few small bait schools and it didn’t take long for us to raise a nice fish around 700#. The big girl had a hard time trying to eat the lure and after a very clumsy bite we had her on for a short while before pulling the hook.A little disappointed we headed back to the bait and quickly raised another one. This time the fish ate the lure the right way and after a 20 min fight we released a healthy 550 pounder in great condition. Lisa was stoked and Jonboy and I were very happy with her efforts in the chair. After lunch we missed another fish around 500# topping off a great day! Also today “Katherine B” let a big one go around 1000#. 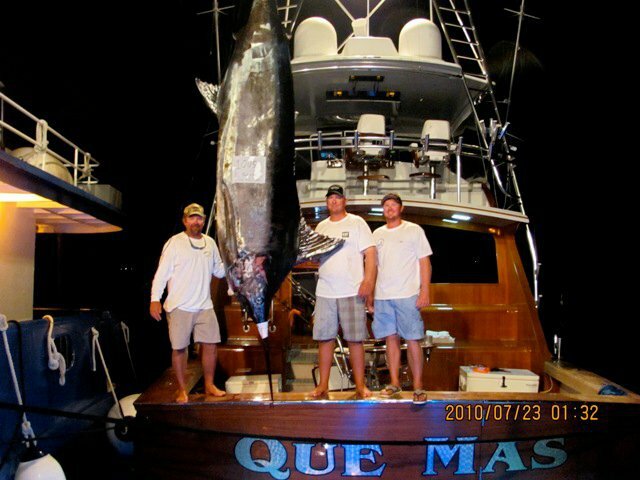 1005# Blue Marlin "Que Mas"
I just got word of another big one weighed in Bermuda. “Que Mas” was heading back to Florida when they got piled on approx. 50 miles south west of Bermuda. They fought the big girl into the dark and after a tough fight they put her in the boat. They ran back to Bermuda and weighed her on the “Madam”. She pulled the scale down to 1005# and is the 3rd grander weighed there in the last week.Big congrats to all on board. It would not surprise me if there is a few more big fish weighed there before the season’s over. There was a few more fish seen here in Madeira yesterday. “Sorted” released a nice fish they called 600#,”Katherine B” broke line on a big fish that they said was around 1000# and “Tightline” raised a decent fish that would”t eat. I also talked to my good mate Jason Holtz yesterday and he was saying the fishing in Kona has been slow this season. 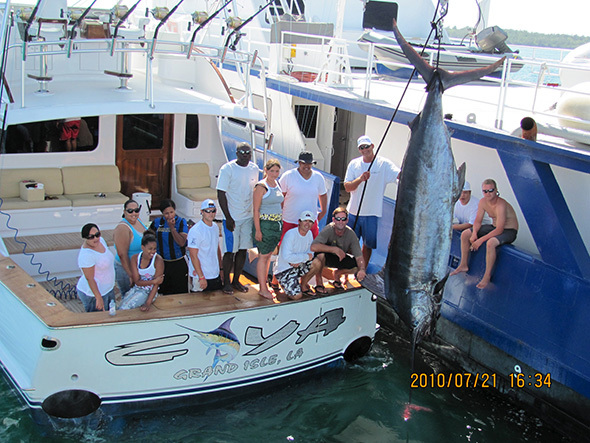 They have been catching around 4-5 fish per day between the 20 -25 boats fishing. After a slow start to the season the fishing has picked up in Bermuda over the last few week’s. Well known local charter boat “Wound Up” put a 858# fish in the boat and lost a nice fish around the same size the following day. “Playmate” was out commercial wahoo fishing when they got lucky and boated Bermuda’s first grander for the season weighing 1012#. 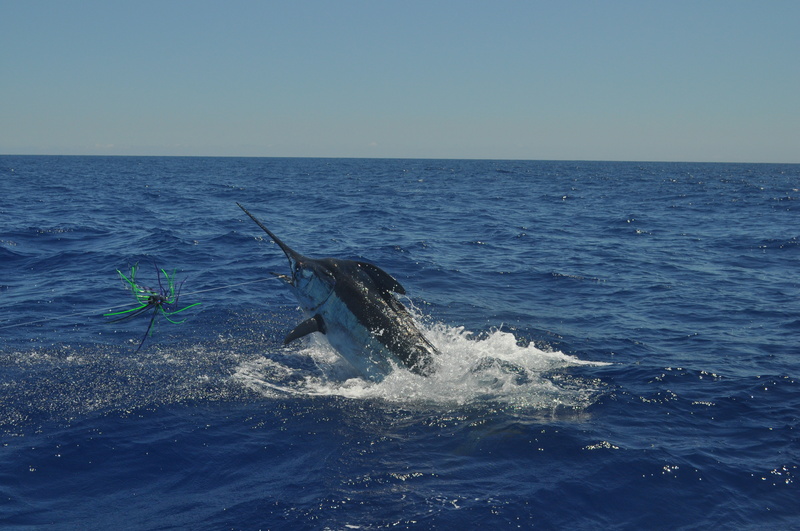 Visiting boat “Que Mas” had an action packed day releasing 5 blue marlin and another visiting boat “C-YA” weighed a 1005# blue. I don’t have much to report on from over here in Madeira. After 3 fishless day’s for the fleet “Margarita” released a nice fish yesterday and this morning “Katherine B” pulled the hook on big fish that they called over 800#. The bigeye tuna that were here are few weeks ago have all disappeared and there just seems to be the odd marlin cruising around. Hopefully big Julie is out there somewhere. Yesterday we finally had some luck on our side. Fishing off the cement factory near Funchal we raised a nice fish on the teaser. We wound in the teaser hoping she would fade back onto the short lure’s. Instead she was down deep watching the propeller’s. I quickly handlined up the short corner lure and she piled all over it, awesome bite right on the first wave. The big girl fought hard and she did some nice jumps around the boat and on the leader. Mike did a great job in the chair and he was stoked to catch his biggest blue. After about a 20 minute fight we let her go in really good condition. We all agreed she was a solid 750#. As we were fighting our fish “Hawkeye” hooked up a nice fish right alongside us. They fought the fish for a while and when they finally got her to the boat they couldn’t revive her. They decided to put her in the boat and she weighed 649#. Even though their were a couple nice fish caught the fishing in general is still slow for the fleet. Today “Hawkeye” released a big one they called 850# on 80#.